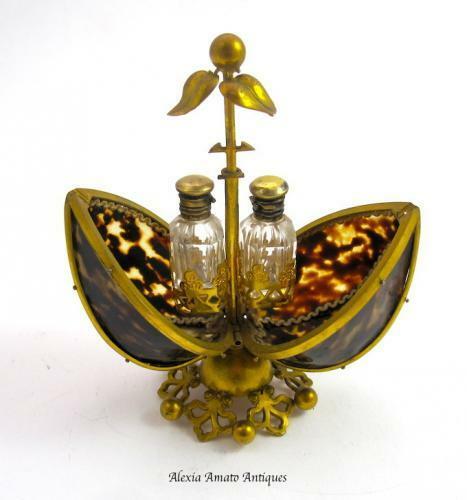 Antique French 19th Century Tortoiseshell Casket with Dore Bronze Mounts and Encasing 2 Perfume Bottles. The Egg Shaped Casket Sits on Intricate Dore Bronze Base and the Top Finial is Adorned by 2 Dore Bronze Leaves. Each Bottle Includes ists Original Inside Stopper. Scent Bottles 4cms High / 1 1/2 Inches High.